← Why doesn’t the BBC tell audiences about Gaza’s shortfall missiles? 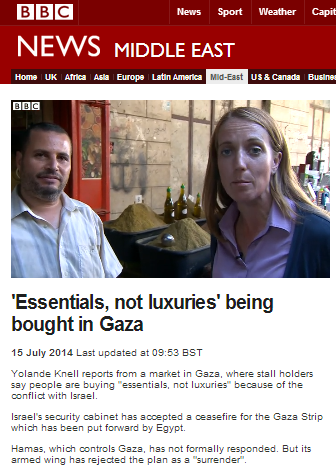 A filmed report by Yolande Knell from July 15th which was promoted on the BBC News website under the title “‘Essentials, not luxuries’ being bought in Gaza” as well as being broadcast on BBC television news provides an interesting example of how the framing of a story can actively prevent audiences from properly understanding an issue. Knell reports from a market in Gaza City. As we see, audiences are encouraged to believe that the difficult economic situation in the Gaza Strip is primarily – if not exclusively – attributable not to the ineptitude of the Hamas government which ruled it for the last seven years and not to that organisation’s decision to divert resources into terrorism rather than building a sustainable economy and a healthy civil society, but to Israeli and Egyptian policies enacted in order to cope with that terrorism. This, of course, is the topsy-turvy line which Knell has been pushing for some time now – as we have documented here in the past (see examples here, here and here). The phrase “tight border restrictions” is frequently used by Knell and other BBC employees without any adequate explanation of what that actually means. In fact the only restrictions in place are those prohibiting the import of weapons (as, one imagines, is the case at most international borders) and dual-use goods which can be used for military purposes to the Gaza Strip. Even those dual-use goods can be imported into the Gaza Strip with special co-ordination and on condition that their use is supervised. All other goods can enter the Gaza Strip from Israel freely. Notably, neither Knell nor any other BBC journalist has in the ten days since the conflict began seen fit to inform audiences that humanitarian aid has continued to be supplied to the Gaza Strip throughout the entire time. But Knell’s final sentence is particularly interesting – especially because of what it does not tell viewers. Banks in the Gaza Strip were indeed closed for six days at the beginning of June but Knell neglects to inform audiences why and the BBC did not report on the topic at the time. “Banks in the Gaza Strip reopened Wednesday, after being closed for six days following a cash-run on the banks by Palestinian civil servants demanding unpaid salaries, Palestinian media reported. Hamas demanded Thursday that the Palestinian Authority take employees of the disbanded Gaza government onto its payroll, after the PA’s Gaza-based staff received their salaries but their Hamas counterparts went empty-handed. So in other words, the banks were closed because the Hamas private militia closed them because the Palestinian unity government to which it is party and which it agreed would rule the Gaza Strip instead of Hamas wouldn’t do what Hamas wanted. Now doesn’t that sound rather different to the version of the story Yolande Knell is telling BBC audiences? But the really important part of Knell’s omissions in this report and others in relation to the current situation is that one of the conditions presented by Hamas for a ceasefire to end the current round of conflict is that the PA pay these people (some of whom are employees of Hamas’ Izz ad Din al Qassam Brigades) anyway. So far, the BBC has failed completely to inform BBC audiences of any of Hamas’ demands which are not related to Israel. Another interesting point to note is that whilst the BBC took a distinctly ‘best thing since sliced bread’ approach to the Hamas-Fatah unity deal at the time, since the upsurge in hostilities it has been remarkably reticent about clarifying to BBC audiences the significance of the fact that officially, the Palestinian Authority is in charge of the Gaza Strip – from which well over a thousand missiles have been fired at Israeli civilians in just over a week – in clear breach of existing agreements between the PA and Israel. Now of course all that is a lot more of a headache to explain to BBC audiences than ‘(some) people in Gaza are poor because of Israeli and Egyptian border restrictions’, but if the BBC is to meet its obligation to “[b]uild a global understanding of international issues”, it is going to have to stop dumbing down its reporting and start providing them with the entire picture instead of inaccurate politically motivated sound-bites. what I can’t understand why their office is still open in Israel? BBC is nothing more than bunch of Israel haters. Please delete that comment Hadar (with the link to “democracynow.org”). It was the sockpuppet impersonating me, again. This is what we’re aiming for! yea!! I read your linked article – very interesting. I do not agree that we are ‘all Hamas now’ either. However, your writer omits any mention of ‘Illegal Occupation’. Why is this? He omits any mention of the institutional and systemic failings that have allowed this ‘situation’ to continue. Why is this? He , like all pro-‘all Palestine is ours’ Israelis forgets to mention what Israel’s ‘end game’ is. Why is this?! He forgets to mention what he’d do, in a just, fair and humanitarian way, for the 4.5 million Palestinians in Gaza/West Bank. Why is this! ?